Fall is synonymous with pumpkin around here, so my sister and I couldn’t resist making three different DIY pumpkin treats for our dogs. 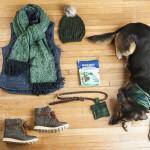 All of these are so simple and our dogs think they are irresistible! All photos are by my super talented sister, Alice G Patterson Photography. 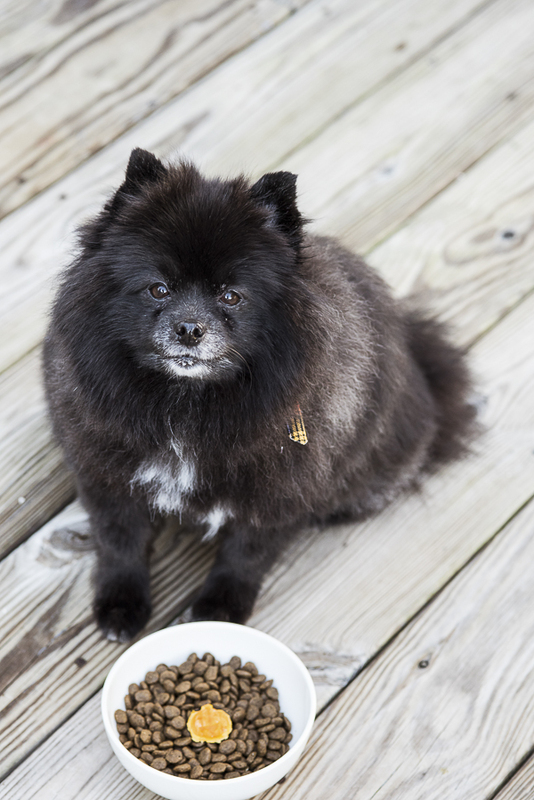 Pumpkin can be a great digestive aid for dogs and cats. The first “recipe” is one of the easiest treats you can make. 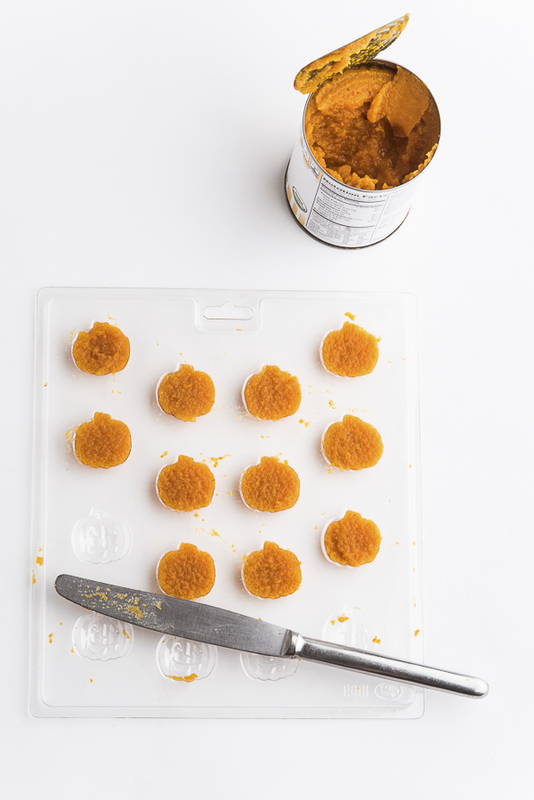 Simply open a can of pumpkin (NOT PIE FILLING) and scoop out into ice cube trays. 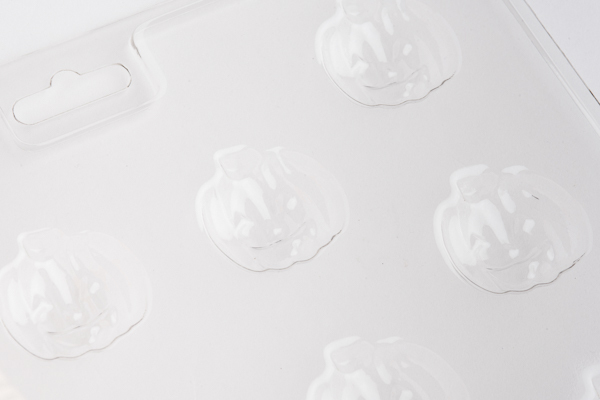 To help get in the spirit, we used a fun candy mold similar to this one. Freeze until solid. You can store them in a plastic container or freezer bag. 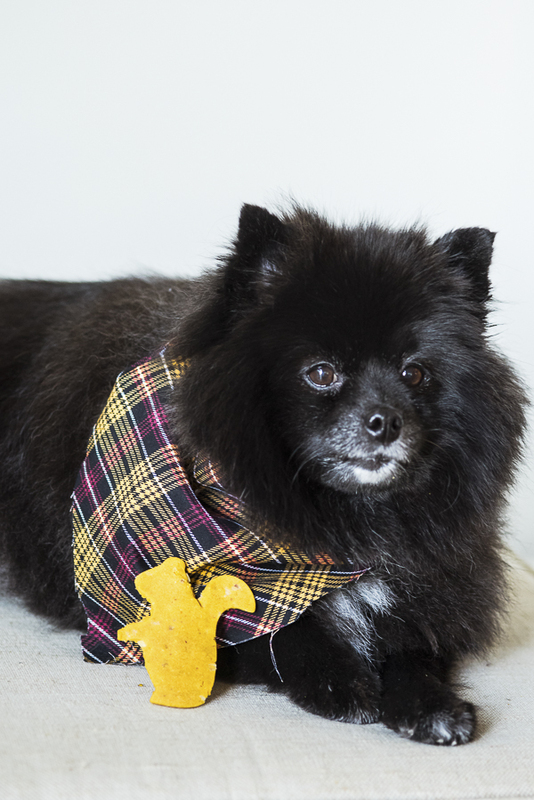 Darla, my sister’s Pomeranian, the official taste tester for this shoot, loved her job! The second recipe is a little more involved but still falls under the “VERY EASY” category. 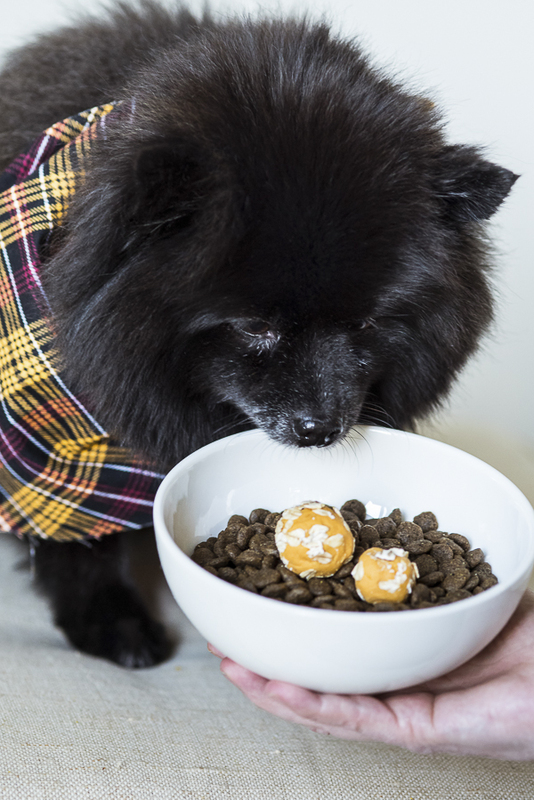 These pumpkin balls have only a few ingredients are perfect for my allergy prone dog, Nelly. I found the recipe for No Bake Pumpkin Oat Dog Treats by Two Little Cavaliers. They are perfect as a food topper, treat, or a pill pocket. You can make them whatever size you like. As you can see, I was making them for two different sized dogs, or possibly I was distracted. 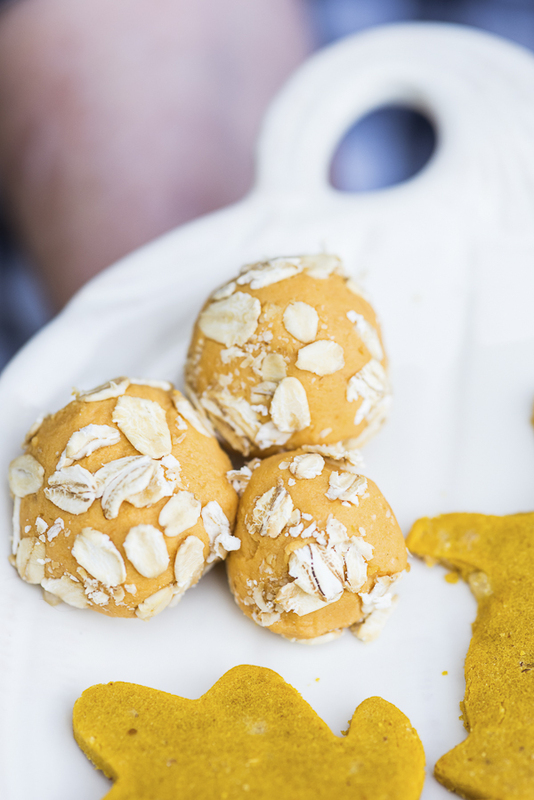 All of our dogs, as well as my cat, love these pumpkin oat treats. Darla was particularly excited by the third pumpkin treat. I know it looks like she’s ignoring the squirrel, but the truth is she’s just waiting for her okay signal. (She’s a very good dog!) The final recipe is slightly more involved, but worth it! This recipe calls for only three ingredients: pumpkin, peanut butter, and flour. I used rice flour because Nelly is sensitive to wheat. You can find the recipe here. I made large cookies for the fun factor as well as smaller ones for convenience. Because my dogs are little, they shouldn’t have a whole cookie at once. These are fairly soft and are easy to tear into smaller pieces. As anyone who has made a batch of roll out cookies knows, it can be tiresome to complete a full batch. After I made about 10 nicely shaped cookies, I switched to my own method. I rolled out the dough, and then cut it with a knife into rows. I cut it again perpendicularly to make small square treats. 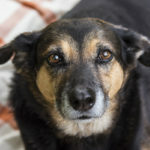 To learn more about the nutritional benefits and dangers of pumpkins for dogs, check out this post from Fidose of Reality. Follow Alice Patterson on Instagram to see more of her photography. If you want to jump on the pumpkin bandwagon, but don’t have time or energy to make these simple treats, you might want to try Fruitables. About Alice G Patterson Photography: Based in Syracuse, New York, Alice specializes in photography for small businesses (products as well as portraits), senior portraits and dog photography. 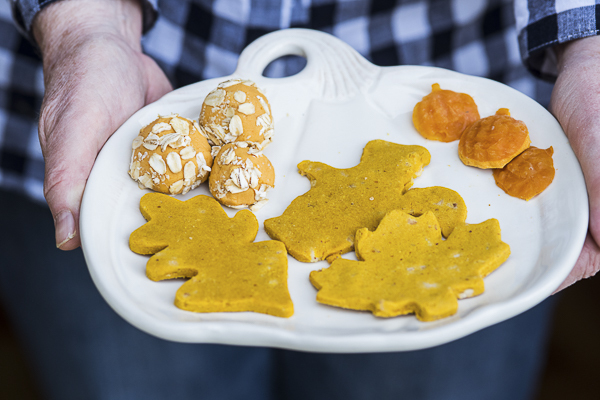 We LOVE pumpkin and all 3 of those look delish!!! I’m gaining weight just reading this! But looks delish. I want your pooch! LOVE LOVE LOVE! Mommy loves the candy molds. Pumpkin is good for us, too. The little pumpkins are adorable. These are so easy and fabulously healthy for our babies – we can’t wait to make them! Thanks for sharing and you bet, we’ll share with our readers too! What adorable treats! 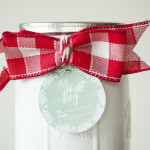 I need to get on it…I have been slacking this year with cooking yummy treats for my pups! These are a great place to start. Thanks for sharing! These are three fantastic treats!!! I love the pumpkin and oat treat! 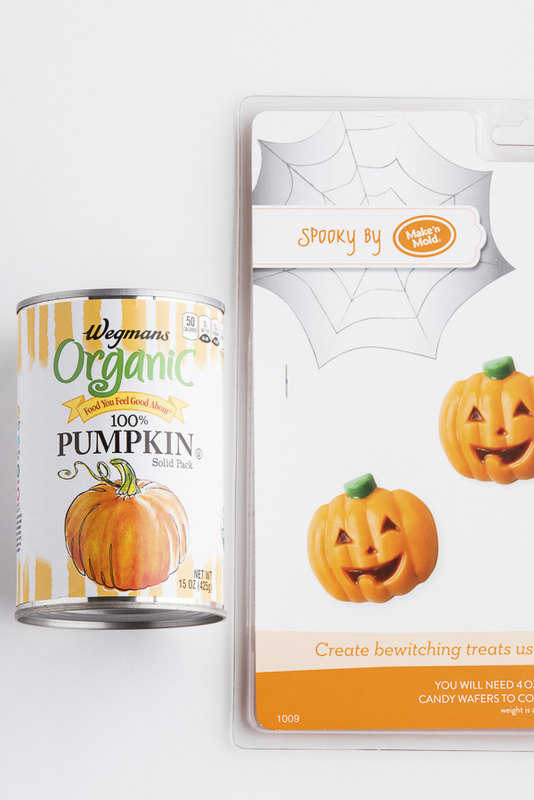 What a wonderful idea for treats! They look delicious, I’m sure my dogs would gobble them up. Thanks for the great ideas. Oops, hit submit too quickly. I think I will definitely try the no bake recipe – I should be able to handle that one! I love these ideas! They are so cute! Sadly, neither of my dogs can treats. I have a Yorkie with a weak stomach and a Westie with food allergies. What a lovely post. No one can tell me there are no homemade treats for dogs to enjoy! I send them right here!!!!! Love Darla too, she can visit us in New Zealand any time!!!! These are so lovely! I can see our dog really enjoying this, plus I have an excess of pumpkin puree I put up in the freezer last month. I really like the idea of using the mold. 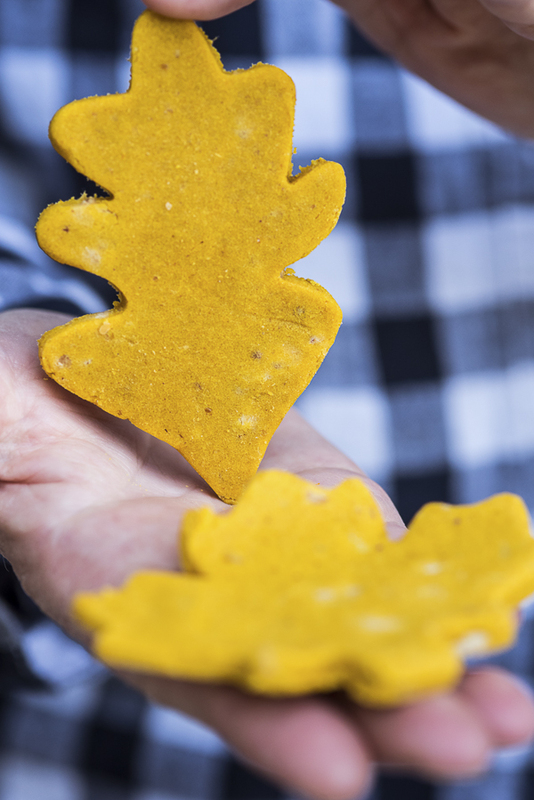 These cookies look delicious – pumpkin has so many great benefits for our pets! So cute. I love him. 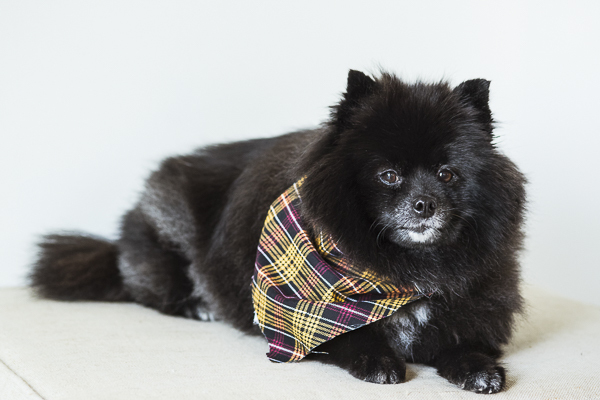 I love his scarf. I love his Greg beard! These are almost too cute to eat! The Goldens love anything pumpkin, thanks for sharing! I’d love to do something like this but my dog is picky and rarely eats ‘healthy’ treats. I’d have to try them on someone else. These treats are so cute! I think they are perfect for fall. Pumpkin is so good for a dog’s digestive tract too. My dogs love pumpkin treats! I haven’t made any in awhile for them. I will have to try these out! 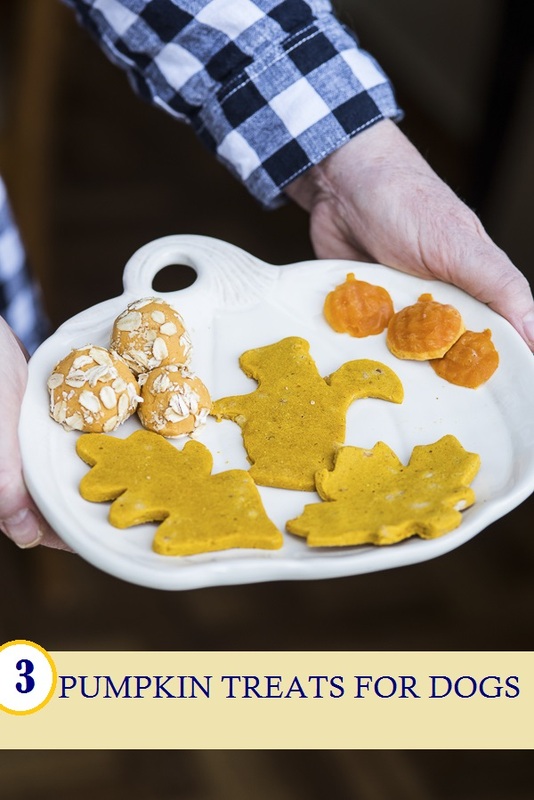 I love the pics of all these cookies – you made PERFECT Pumpkin cookies and I was just looking for some easy DIY recipes for tomorrow as we need a way to celebrate since we don’t get a lot of trick or treaters! 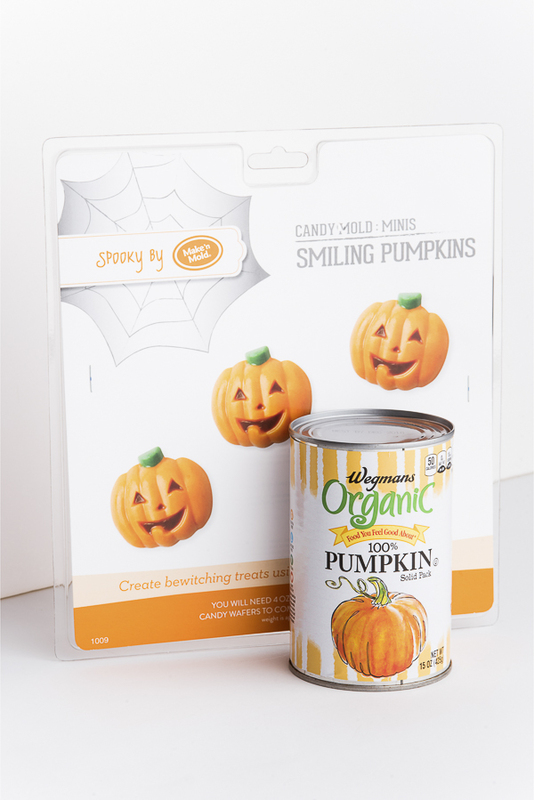 Those little molded pumpkins are cute! We’re going to have to try those. Darla is precious! Amazing photos (kudos to your sister) and great post. 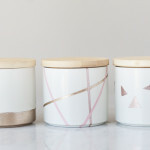 I love that you found inspiration from fellow bloggers and included them on the fun. I can’t wait to make these for our upcoming Thanksgiving celebration for our neighborhood dogs. I didn’t know pumpkin was good for digestion in dogs. I always make all our dogs treats from scratch. They are that spoiled. I am mighty impressed and the dogs are adorable. I am pinning for my dog. I make him mutt meatballs. I bet he loves the mutt meatballs! I’m getting ready to make something similar. These are so cute and healthy. You are a great doggie mom. My girls loved being taste testers and models for these homemade treats… they loved them all! I was literally poring through recipes yesterday looking for something made with pumpkin! I bought pumpkins last fall and froze some of the puree. I’m trying to use it up now before having fresh pumpkins this fall (from my own garden this time!). These are great, because simple is important for me. 🙂 I’ve mixed the pumpkin with yogurt and froze it in trays, but never did just the straight pumpkin for the dogs, what a great idea! That is fantastic that you have your own crop of pumpkins! My dogs love it any way we serve it.